Oh, and before you think I'm good at seasonal decorating, I totally snagged this mums-in-the-jack-o-lantern idea from one of Heidi Kenney's instagram photos. I thought it was so cute and clever! Those tights are so cute - I saw your DIY on ABM aswell, I think you might be one of my favourite bloggers at the moment. I'm in love with this dress!! the tights is too cutee! That dress is so cute. I used to have a sailor top that I loved to wear! After seeing your cute self I wish I had held onto it. The mums in pumpkins are adorable. Love it as usual Katie! You look super cute in that! This entire outfit is gorgeous on you! I love the yellow hat with your hair colour! Oh my word that dress is to die for!! Love love everything about these pictures, the front stoop, the clothes, LOVE IT! This is so cute! i love the boots! Oh katie katie katie... I love your style! And I'm wearing a dress that kinda looks like that. Hint, Dear Creatures Fall 2012. Second hint, you have it in orange. I absolutely love this dress! You look beautiful as always. ooooooooooh those tights are super cool. Love your front porch! We went last weekend and Elle does not "get it" ... She kept trying to pick up the pumpkins, but called them balls the whole time. Have fun!! Your dress is so pretty. I love anything and everything sailor inspired! The little red ridding hood tights your wear are adorable. I love printed tights. Also, your mums in a pumpkin are too cute! I love this outfit! That dress is super pretty and I love your Halloween decorations! 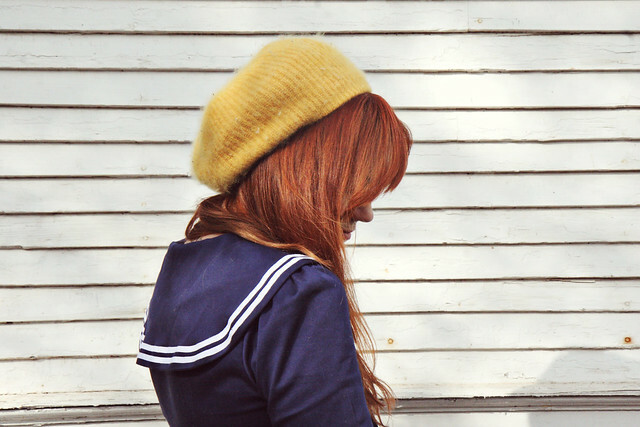 Love the hat with this sailor dress- it perfectly carries it into the autumn season. REALLY cute dress. I love the way you have put this outfit together. Absolutely LOVE this outfit. Such cute tights! cute dress! love the fun print on the tights too. ciao! you (ad)dress your blog admirably. That dress is adorable! I'm going to have to check out Blessed Buttons. I love your Christmasy tights! You always look adorable. Totally in love with this look from head to toe. I love your dress. I think I may have to try the pumpkin idea! It looks so lovely. awww love navy and mustard! Aaw you make such an adorable sailor! What a perfect sailor dress!!!! Look forward to seeing more of her work! !